English muffins remind me of my childhood. My dad would always have them stocked in the bread drawer for a quick and easy breakfast, or as a vessel for his favorite "cheese surprises". I liked english muffins and would eat them, but I wasn't in love. They were always too crumbly for my taste. And they were definitely lacking flavor. I didn't fall head-over-heals until I started making my own. Now, I look for any excuse to make them! Breakfast sandwiches have become an all time favorite meal of ours. One that I particularly like to make as a breakfast dinner. Now that I have found the love of making english muffins myself, I am always eager to try different ideas. 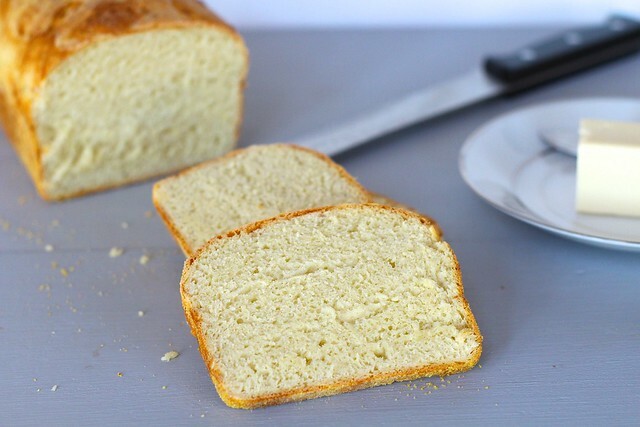 When I saw this recipe for english muffin bread, I knew that I had to try it immediately. I was not disappointed. This is a loaf form of an english muffin that still has the nooks and crannies for butter and jam to get caught in. Brilliant! It definitely knocks the socks off any store-bought english muffin I've ever had! If you are an english muffin lover, but haven't tried to make a homemade version, you definitely want to start here! Less complicated, and less equipment required. The perfect addition to any breakfast or snack! In the bowl of a stand mixer fitted with the paddle attachment, add the flour, sugar, salt, baking soda, and instant yeast and stir to combine. In a microwave safe bowl or measuring cup, combine the milk, water, and oil and heat to between 120°F and 130°F. Make sure to stir the liquid before measuring its temperature. If you don't have a thermometer, test the mixture with your finger, it should feel hot, but not scalding. Pour the hot liquid over the dry ingredients in the mixing bowl. Beat at high speed for 1 minute, the dough will be quite soft and sticky. Lightly grease an 8 1/2" x 4 1/2" loaf pan, and sprinkle the bottom and sides with cornmeal. Scrape the dough into the prepared pan. Cover the pan with greased plastic wrap, and let the dough rise until it's just barely crowned over the rim of the pan, 1- 1 1/2 hours. When the dough is just beginning to rise over the edge, preheat the oven to 400°F. Remove the plastic wrap, and bake the bread for 22 to 27 minutes, until it's golden brown and its interior temperature is 190°F. Remove the bread from the oven, and let cool for 5 minutes. Then, turn it out of the pan onto a rack to cool. Let the bread cool completely before slicing.